Click to viewFor the first time ever, two animated science fiction movies will open the same day, this Friday. 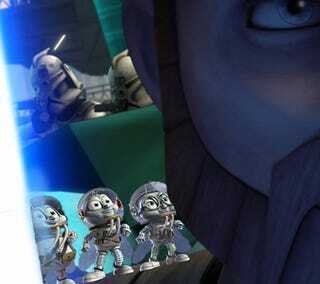 Of course, Star Wars: Clone Wars will smush the flies-in-space epic Fly Me To The Moon like... well, like a bug. But this animated traffic jam is still significant, because of what it signals: the rise of animated science fiction from a minor subgenre to a full-blown genre in its own right, complete with a range of competing styles. There's been plenty of animated scifi before this summer, of course - Fox and Blue Sky put out the bog-awful Robots a few years ago, and Disney/Pixar did The Incredibles. There's been underground-y weird animated scifi like Heavy Metal since the 70s, and plenty of animated science fiction/comics stuff on TV. And while we've been dragging our feet in the U.S., the Japanese have been putting science fiction anime on the big screen for decades. But this will be remembered as the summer science fiction animation broke out, mostly thanks to Wall-E and Clone Wars. It's not just that both films will probably end up having been box-office successes. They're also so different from each other, in style and storylines, that you won't be able to think of science fiction animation as being restricted to a kind of space-operatic goofiness or superhero pastiche ever again. Whether you love either of those films, they're both a proof of concept for two different ways of approaching big-screen CG-animated science fiction. At first, I thought the science fiction animated boom would be self-limiting, because of a string of wretched films in the pipeline, like Space Chimps, Fly, and (I have a feeling) the forthcoming Planet 51. These films sport a cheesy not-quite-Pixar style and paper-thin plots. Unlike Pixar films, which are aimed at kids but speak to adults on a whole different level, the Chimps/Fly movies are barely cogent enough for a really slow child. But Pixar comes to the rescue once again, with the animated Newt, about the last two blue-footed newts in the world, who hate each other but must interbreed in order to save their species. I'm also quite optimistic about Monsters Vs. Aliens, which is based on a great comic book and has put out some really cool images and a great trailer so far. It has a 50-foot woman and a mad scientist with the head of a cockroach, plus a sort of Mars Attacks sensibility. Species Extinction Goes Cutesy in New 3D Pixar Flick "Newt"
Giant Monster-Alien Smackdown... In Your Face! I'm sort of intrigued by Igor, mostly thanks to the incredible cast listing, including Eddie Izzard, John Cleese and John Cusack. It also has a cute premise: the hunch-back who wants to a mad scientist instead of an "Igor." The latest poster looks sort of clunky and awful, but the trailer is cute and funny. A brain in a jar tries to hypnotize Igor, and when that doesn't work, it just hits him with a spatula. Pure win! Movie Has John Cleese And A Brain In A Jar — But Will It Have An Audience? We're also in for a big-screen anime explosion, with American studios involved. Studio Imagi is working on animated Astro Boy and Gatchaman movies, among others. There's also a Heavy Metal remake/homage in the pipeline. Are We In For A New Anime Hurricane? Metal Too Heavy For Paramount? I feel as though these sorts of kid-friendly animated movies have been dominated by fantasy and funny animals for as long as the CG variety has been around. (There's no science behind talking toys in Toy Story or talking cars in Cars.) But now the pendulum is swinging toward scifi premises, maybe as more creators who grew up on scifi in the 1950s and 1960s take charge. 1) Science fiction is the new fairy tale, and that's an awesomely good thing. Who could watch Wall-E without starting to think of him as a young commoner who gets swept up into a castle by a princess, only to discover his own nobility? Etc. etc. The Igor trailer even includes the "Once upon a time" caption. I could totally see Clone Wars' Ahsoka turning into a fairy tale heroine (although she's probably destined for a bad end.) It would be great if generations of kids grew up thinking of robots and scientists the way earlier Disney watchers thought about princesses and flying elephants. 2) On the flipside, even as these animated scifi movies become fairy-tale-ish, they're also more serious and thoughtful than most "grown-up" science fiction movies. Of the summer's big blockbuster films, how many were as smart and debate-provoking as Wall-E? Off the top of my head, I'd say Iron Man and Dark Knight, and that's it. Okay, so Clone Wars is not going to be smart or thought-provoking, I'm pretty sure. But movies like Newt, Igor and Monsters Vs. Aliens at least have the potential to throw in some clever concepts and make you think about issues like extinction, the class system, and the rights of monsters. So I'm cautiously excited about the new scifi animated boom — and I think it's going to be around for a while.